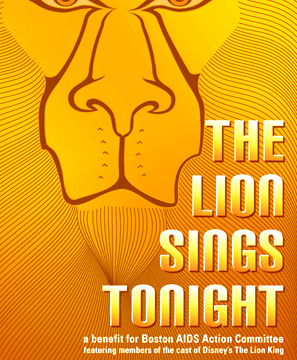 The cast and crew of "Disney’s The Lion King" will host "The Lion Sings Tonight" – a cabaret-style show featuring a generous mix of rock ‘n roll, pop and R&B numbers, as well as dance and comedy. This special one-night event will be held on Monday, March 1, at 7:00 p.m. at Club Cafe at 209 Columbus Avenue. Tickets are currently on sale for $25. Audience members will enjoy more than a dozen performances, including songs by cast members, Marja Harmon (Nala), Jered Tanner, Ben Roseberry (Ed) and Omari Tau (Banzai). In addition, attendees will also have an opportunity to win a variety of door prizes. All proceeds will benefit AIDS Action Committee of Massachusetts (AAC). Founded in 1983, AIDS Action Committee of Massachusetts, Inc. (AAC), is New England’s first and largest AIDS organization. Its mission is to stop the spread of HIV/AIDS by preventing new infections and optimizing the health of those already infected. AAC accomplishes that mission by providing free support services for 2,600 men, women and children living with AIDS and HIV; educating the public and health professionals about how to prevent HIV transmission; and advocating for fair and effective AIDS policy at the city, state and federal levels. "Disney’s The Lion King" is playing the Boston Opera House through March 21. Tickets for "The Lion Sings Tonight" may be purchased in advance online at www.aac.org/lionsings or at the door. All seating is general admission.